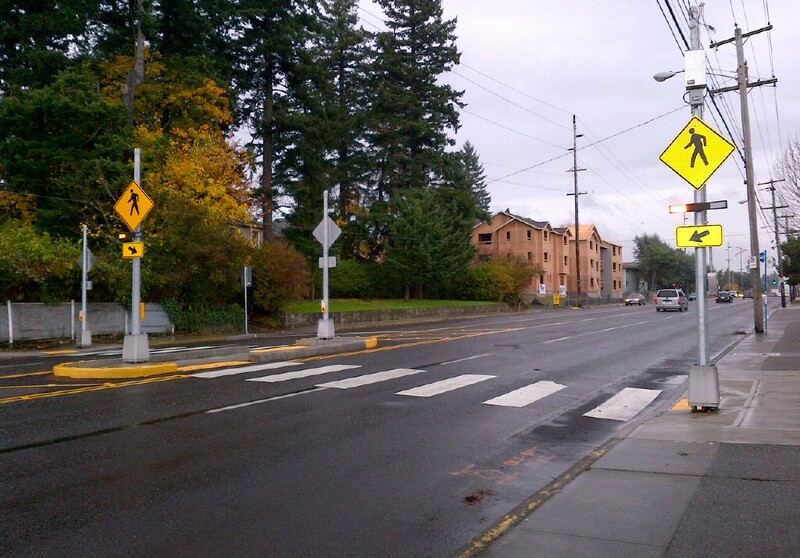 TriMet worked closely with the City of Portland on the Division Streetscape project. Among the improvements benefiting our riders are curb extensions for bus landings and marked crosswalks like those at this stop on SE Division at 17th Ave.
During the last two years, more than 370 TriMet bus stops have seen improvements, with additional projects underway or in the planning stage for another 100 stops. Concerned yours isn’t one of them? Consider this: TriMet has 6,660 stops throughout a 533 square-mile service district and the vast majority of them are on property not owned by TriMet. Improvements to our bus stops require help from our city, county and state partners; private property owners and you. We are excited about the improvements made recently, which range from adding landing pads and lighting, to putting in seating and shelters, to installing sidewalks and safer crossings treatments; but there’s more work to be done. We hear that from some riders who use less than stellar stops and we saw that with photos sent to The Oregonian recently. 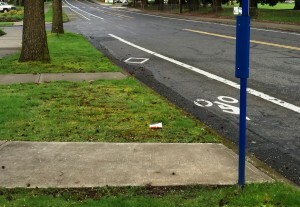 The biggest issues that we hear about bus stops are related to access, amenities and trash. Let’s dig deeper into each of those starting with the most common complaint – access. Before you get on board a TriMet bus, you have to get to the bus stop. “Every transit rider is a pedestrian, first and last, but accessing transit isn’t always easy,” says Alan Lehto, TriMet director of planning and policy development. In front of the Hillsboro WinCo on Hwy 8, in place of a drainage ditch along the roadway, now a wide sidewalk with a bus shelter greets riders because of a partnership between ODOT, Washington County and TriMet. Walking with your child along a roadside ditch to a bus stop is a much different experience than strolling along a wide sidewalk with a landscaped buffer between the roadway and you. Waiting next to a bus stop pole in the middle of TV Highway is a world away from waiting in a lit up bus shelter connected to a wide sidewalk. “Access is a critical part of what makes transit work but we don’t have control over it,” says Lehto. Many areas throughout the TriMet service district may lack the infrastructure for bus stops, but there is still a need to provide transit service to nearby neighborhoods, especially in low income areas where many are transit dependent. So you may see a bus stop pole in a less than ideal location to provide nearby residents with service without making them walk long distances in areas without sidewalks. On one stretch of Highway 99W in Tigard, riders have to walk along the shoulder while just a half mile down the road, wide sidewalks have recently been installed making it much easier to get to the bus stop. In 2012, TriMet released the Pedestrian Network Analysis. It highlights some of those areas with the most need and the most opportunity for pedestrian improvements that would make it easier for people to ride transit. The analysis lays the groundwork for the public and private partnerships and investments necessary to make those improvements possible. A partnership between TriMet and the City of Portland has placed marked crosswalks, signage, lighting and rapid flashing beacons when possible at key crossing such as NE 60th at the MAX Overpass, SE Stark and 126th Avenue, SE Division at I-205 and SW Beaverton-Hillsdale Highway and 62nd Avenue. While improvements have been made to hundreds of bus stops in the past two years, more are coming. 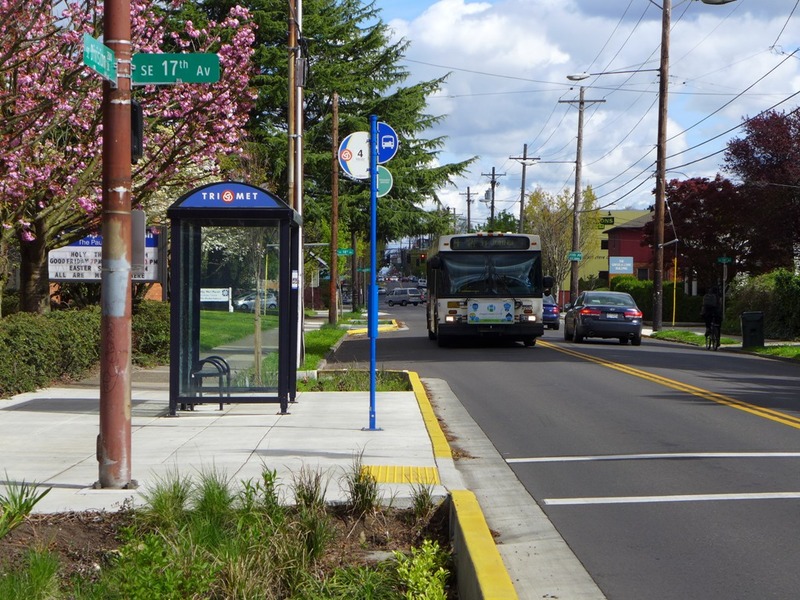 Recently, TriMet successfully led our jurisdictional partners to secure funding for projects that will create better access for many bus stops in three corridors in the region: Powell-Division, Barbur-99W and Highway 8 from Beaverton to Hillsboro. The money, about $6.5 million, comes from the Oregon Department of Transportation’s (ODOT) competitive Statewide Transportation Improvement Program’s (STIP) Enhance funding process. While ODOT will provide the majority of the money using flexible federal funds, TriMet and the local jurisdictions contribute about 10 percent in matching funds. Learn about the Corridor Safety & Access to Transit projects. TriMet continues to work with our partners to make improvements that will increase and make access to transit better throughout the region. I made it to the bus stop, now what? The majority of TriMet bus stops are outside of our transit centers and therefore on someone else’s property, whether it’s a city sidewalk, a county right-of-way, along a state-owned highway or on private property. As with encouraging advancements to make accessing our stops easier, we also work with our partners to improve the stops themselves. At the busy intersection of SW 185th and TV Highway in Aloha, what was once a narrow sidewalk with a dirt patch where riders stood, now features a wide sidewalk with a shelter thanks to a partnership between TriMet and ODOT. TriMet staff also works with private property owners and actively builds relationships with companies and developers to make sure transit is forethought not an afterthought on private property. Outside the new Walgreens at the corner of SW Farmington and 185th, where riders once stood in the mud, now they have a wide path and a shelter based on TriMet feedback during the development. TriMet worked with developers when the Fred Meyer block on West Burnside was transformed. Where riders previously experienced a tight sidewalk and tight shelter, now they have a wide sidewalk with a covered bus stop bench designed into the side of the building. 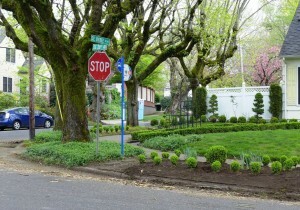 Many neighborhood stops like this one at SE 28th and Bybee Blvd do not have space for amenities. Thousands of bus stops are spread out in neighborhoods throughout the TriMet service district, on land adjacent to private property or in parking strips. These are stops where benches and shelters may not fit physical or stylistically. TriMet takes the setting, space and ridership into consideration when determining if amenities are warranted. Shelters are considered only at stops with at least an average 50 weekday boarding rides. Instead of throwing an empty cup into the trash can about 15 feet away, putting it in the garbage can on board the bus or just packing it with them, a rider instead litters at this SE Portland stop. Riders don’t like stops strewn with trash and neither do we. Litter is one of the most common complaints we hear about bus stops – and it’s preventable. If there’s not a trash can or the can is full, don’t litter. It’s unsightly and illegal. Please pack your trash with you. With more than 6,600 stops spread out throughout three counties, TriMet is only able to maintain trash cans at bus stops with shelters and the very highest of ridership. While we do our best to stay on top of litter and vandalism, it’s a huge task and we appreciate individuals who take it upon themselves to pick up the random cup tossed on the ground at a stop, or businesses and community organizations that volunteer to help us maintain litter-free stops. Through our Adopt-a-Stop program, TriMet works with more than 160 volunteers to provide trash cans at some 200 bus stops. In this program, TriMet provides a can with a plaque thanking the group for their sponsorship. The business, church, community group or other organization agrees to empty the trash can as needed. If there is damage or graffiti to the can, TriMet takes care of it. 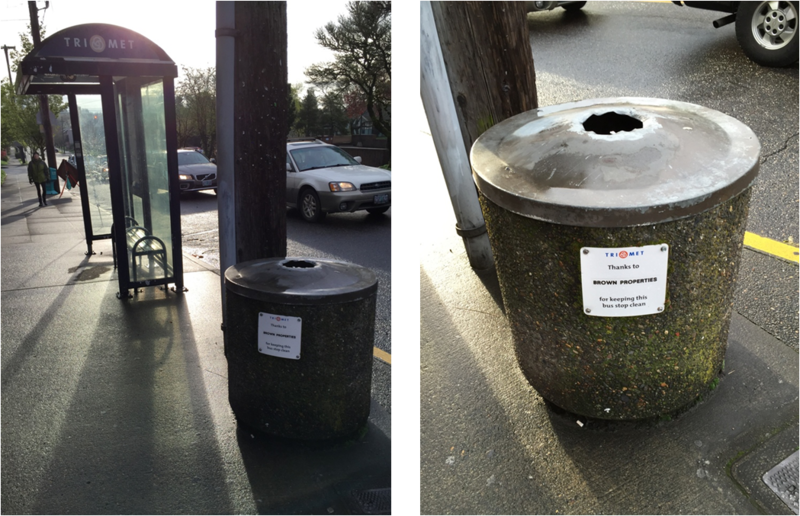 This garbage can at a Line 19/70 stop in Sellwood is maintained by a business group. Thanks Brown Properties! Weigh in on transit, walking and biking issues in your community and participate in the decision-making process. Go to trimet.org/getinvolved to share your thoughts. Are you a part of a business or community group interested in trashing the trash at bus stops? Go to trimet.org/adopt-a-stop. Don’t throw your trash on the ground at a stop and if you spot a piece of garbage, please pick it up. That sets a good example for others to follow. And, let us know when you spot an issue at a stop. Go to trimet.org/contact.